Oliver Messiaen's compositions for organ belong to the most outstanding music written for this instrument in the 20th Century. 2008 was the year celebrating his anniversary and was filled with performances, publications and commemorations of the distinguished French composer's 100th birthday. He could also be termed the theological composer of the previous century. 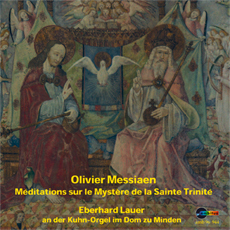 The only new complete recording of Messiaen's organ music for this anniversary has been presented by Eberhard Lauer with ambitus in 2009. Eberhard Lauer is the church music director at the Mariendom in Hamburg and honorary professor at the College of Music in Lübeck. He has performed Messiaen's organ music in numerous concerts and can often be heard internationally. Lauer studied, amongst others, with Almut Rößler, who was the first to release a complete recording of Messiaen's organ music, now long since out of print. He was also a student of Xavier Darasse, himself a significant Messiaen-student and recognised interpreter of Messiaen's music. The organs used in the recording are well-known instruments in Minden and St Johannis, Hamburg-Altona, and were built by the organ manufacturers Kuhn (Switzerland). The instruments and the acoustics are both well-suited to Messiaen's music. A new approach has been taken in the choice of instruments, reflecting in a new way the Messiaen “post Cavaillé-Coll” sound ideal. All CDs contain a short introduction followed by Messiaen's own texts. These are printed in three different languages (German, English and French) and are not to be found in other recent CD editions. Thus these important documents concerning Messiaen's work are made available to a broader public in the original language (as written in the scores) and also in translation.